2. an actual or potential cavity of the body. 3. the areas of the universe beyond the earth and its atmosphere. adj., adj spa´tial. danger space a subdivision of the retropharyngeal space, extending from the base of the skull to the level of the diaphragm; so called because it provides a route by which infection of the pharynx can spread to the mediastinum. dead space see dead space. epidural space the space between the dura mater and the lining of the spinal canal. intercostal space the space between two adjacent ribs. interproximal space (interproximate space) the space between the proximal surfaces of adjoining teeth; called also proximal or proximate space. intervillous space the space of the placenta into which the chorionic villi project and through which the maternal blood circulates. lymph s's open spaces filled with lymph in connective or other tissue, especially in the brain and meninges. Meckel's space a recess in the dura mater that lodges the trigeminal ganglion. medullary space the central cavity and the intervals between the trabeculae of bone that contain the marrow. palmar space a large fascial space in the hand, divided by a fibrous septum into a midpalmar and a thenar space. parasinoidal s's spaces in the dura mater along the superior sagittal sinus which receive the venous blood. perivascular space a lymph space within the walls of an artery. plantar space a fascial space on the sole of the foot, divided by septa into the lateral, middle, and median plantar spaces. pneumatic space a portion of bone occupied by air-containing cells, especially the spaces constituting the paranasal sinuses. proximal space (proximate space) interproximal space. retroperitoneal space the space between the peritoneum and the posterior abdominal wall. retropharyngeal space the space behind the pharynx, containing areolar tissue. subarachnoid space the space between the arachnoid and the pia mater, containing cerebrospinal fluid. subdural space a narrow fluid-containing space, often only a potential space, between the dura mater and the arachnoid. subphrenic space the space between the diaphragm and underlying organs. subumbilical space somewhat triangular space in the body cavity beneath the umbilicus. Tenon's space a lymph space between the sclera and Tenon's capsule. Any demarcated portion of the body, either an area of the surface, a segment of the tissues, or a cavity. See also: area, region, zone. apical space the region between the wall of the alveolus and the apex of the root of a tooth. bregmatic space the anterior fontanelle, situated at the junction of the frontal, coronal, and sagittal sutures. capsular space a narrow chalice-shaped cavity between the glomerular and capsular epithelium of the glomerular capsule of the kidney. cartilage spaces the spaces in hyaline cartilage containing the cartilage cells. corneal spaces the spaces between the lamellae of the substantia propria of the cornea containing corneal cells and interstitial fluid. cupular space the part of the attic above the malleus. danger space a subdivision of the retropharyngeal space, extending from the base of the skull to the level of the diaphragm; it provides a route for the spread of infection from the pharynx to the mediastinum. 1. the space remaining after incomplete closure of surgical or other wounds, permitting accumulation of blood or serum and resultant delay in healing. 2. in the respiratory tract: (1) anatomical dead s., those portions, from the nose and mouth to the terminal bronchioles, not participating in oxygen–carbon dioxide exchange, and (2) physiologic dead s., which reflects nonuniformity of ventilation and perfusion in the lung, is the anatomical dead space plus the space in the alveoli occupied by air that does not participate in oxygen–carbon dioxide exchange. epidural space the space between the dura mater and the lining of the vertebral canal. episcleral space the space between the bulbar fascia and the eyeball. haversian space see under canal. iliocostal space the area between the twelfth rib and the crest of the ilium. interglobular spaces small irregular spaces on the outer surface of the dentin in the tooth root. interproximal space the space between the proximal surfaces of adjoining teeth. Kiernan's spaces the triangular spaces bounded by invaginated Glisson's capsule between the liver lobules, containing the larger interlobular branches of the portal vein, hepatic artery, and hepatic duct. lymph space any space in tissue occupied by lymph. Meckel's space a recess in the dura mater which lodges the gasserian ganglion. medullary space the central cavity and the intervals between the trabeculae of bone which contain the marrow. perforated space see under substance. periaxial space a fluid-filled cavity surrounding the nuclear bag and myotubule regions of a muscle spindle. perilymphatic space the fluid-filled space separating the membranous from the osseous labyrinth. perineal spaces spaces on either side of the inferior fascia of the urogenital diaphragm, the deep between it and the superior fascia, the superficial between it and the superficial perineal fascia. periplasmic space a zone between the plasma membrane and the outer membrane of the cell wall of gram-negative bacteria. perivascular spaces spaces, often only potential, that surround blood vessels for a short distance as they enter the brain. perivitelline space a space between the oocyte and the zona pellucida. Poiseuille's space that part of the lumen of a tube, at its periphery, where no flow of liquid occurs. Reinke's space a potential space between the vocal ligament and the overlying mucosa. retropubic space the areolar space bounded by the reflection of peritoneum, symphysis pubis, and bladder. subarachnoid space the space between the arachnoid and the pia mater. subdural space the space between the dura mater and the arachnoid. subphrenic space the space between the diaphragm and subjacent organs. subumbilical space a somewhat triangular space in the body cavity beneath the umbilicus. thenar space the palmar space lying between the middle metacarpal bone and the tendon of the flexor pollicis longus. zonular spaces the lymph-filled spaces between the fibers of the ciliary zonule. an area, region, or segment of the body, such as the complemental spaces in the pleural cavity that are not occupied by lung tissue and the lymph spaces occupied by lymph. Vox populi A limited or confined area. See Confined space, Cyberspace, Danger space, Dead space, Deep fascial space, Fuzzy space, File space, Intercostal space, Interdigital space, Paraglottic space, Preepiglottic space, Reinke space, Sample space. 1. Any demarcated portion of the body, either an area of the surface, a segment of the tissues, or a cavity. 2. dentistry Synonym(s): diastema. Synonym(s): spatium [TA] . 1. An area or a cavity within the body. 2. A limited area, usually three dimensional. Berger's postlenticular space A space between the posterior surface of the crystalline lens and the hyaloid fossa of the vitreous. The space is believed to be filled with aqueous humour. Syn. retrolental space of Berger. colour sp. A two- or three-dimensional representation of colour stimuli. Example: CIE chromaticity diagram. gaussian space See paraxial region. horopter space The horopter consisting of all object points in space which stimulate corresponding retinal points as distinguished from the two-dimensional cases such as the apparent frontoparallel plane, longitudinal or nonius horopters. image space Region on one side of an optical system in which the image is formed. See object space. intertrabecular space See trabecular meshwork. object space Region on one side of an optical system or a lens in which the object is situated. See image space. Panum's fusional space An area in space corresponding to Panum's area within which there is fusion and stereopsis of a non-fixated target. See Panum's area; horopter. perichoroidal space See suprachoroidal space. suprachoroidal space A potential space located between the choroid and the sclera. Anteriorly it is continuous with the supraciliary space. It contains thin, pigmented strands of collagen fibres and it is traversed by the long and short posterior ciliary arteries and nerves. Syn. perichoroidal space. supraciliary space A potential space located between the ciliary body and the sclera. In this space are thin strands of collagen fibres derived partly from the suprachoroid and partly from layers of the ciliary muscle. This space together with the suprachoroidal space form part of the unconventional route of aqueous humour outflow, the uveoscleral pathway. See uveoscleral pathway. Any demarcated body portion, either surface area, tissue segment, or cavity. n a delimited, three-dimensional region. n the spaces containing loose connective tissue that lie between the body's layers of fascia. The fascial spaces of the neck and head can be involved in the spread of dental infection. n the interocclusal distance or separation between the occlusal surfaces of the teeth when the mandible is in its physiologic rest position. Interocclusal distance is the preferred term. See also distance, interocclusal; clearance, interocclusal. septal space (gingival to the contact point). n the area between the roots of a multirooted tooth; it is normally occupied by bony septum and the periodontal membrane. n a fixed or removable appliance designed to preserve the space created by the premature loss of a tooth. n a type fabricated by a casting technique and cemented into place. n a type not intended to be removable by the patient. 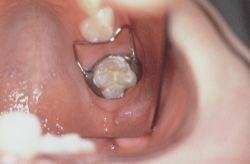 n a removable or fixed appliance fabricated to maintain space in the arch for erupting permanent teeth. The appliance may be designed to regain space needed to accommodate the erupting tooth or teeth. n a type designed for easy removal for cleaning and adjustment. n spaces in the spongiosa of bone; in the mandible and maxilla the marrow spaces are occupied by fatty and hematogenic (blood-forming) marrow. When inflammation progresses into these spaces, the marrow becomes fibrous. The spaces enlarge in atrophy of disuse because of resorption of surrounding trabeculae, and the marrow remains fatty in nature. n the area that contains the masticator muscles that attach to the ramus of the mandible. It is bounded by the superficial layer of deep cervical fascia. n the space between the mesial and distal surfaces of two teeth. n an appliance used to increase the space between two teeth. n the space that might be occupied by persons or radiation-sensitive materials and devices during the time that radiographic equipment is in operation or radiation is being emitted. n an inverted-cone shaped area that extends from the base of the skull to the hyoid bone and is bordered by the superior constrictor of the pharynx and the medial pterygoid muscle. n the area that contains the facial nerve, the parotid lymph nodes, and the posterior facial vein. It is bounded by the superficial layer of the deep cervical fascia. n the air passages up to but not including the alveoli of the lungs; equal to about 150 ml. n a fixed or removable appliance capable of moving a displaced permanent tooth into its proper position in the dental arch. n fabrication of a prosthesis so that certain predetermined, non stress-bearing areas will not be contacted by the appliance. n the area behind the pharynx that contains the retropharyngeal lymph nodes. It is bounded by the prevertebral fascia and the buccopharyngeal fascia. n the superior part of the submandibular space, separated from the inferior part (the submaxillary space) by the mylohyoid muscle. It contains the sublingual gland and the tissue surrounding the tongue. n the area in the neck under the tongue that extends to the hyoid bone. It is bounded laterally and anteriorly by the mandible and is divided into two spaces: the sublingual and submaxillary. n the middle section of the submaxillary space. It contains the submental lymph nodes. 3. the areas of the universe beyond the earth and its atmosphere. 1. space remaining in tissues as a result of failure of proper closure of surgical or other wounds, permitting accumulation of blood or serum. 2. the portions of the respiratory tract (passages and space in the alveoli) occupied by gas not concurrently participating in oxygen-carbon dioxide exchange. small spaces between liver sinusoids and liver cells; conduits for liver lymph. Called also perisinusoidal space. the space between the dura mater and the lining of the spinal canal. fluid spaces separating solid trabeculae in the iridial angle meshwork. the part of the dental arch where there are no teeth. the space between two adjacent ribs. the space of the human and some other placentae into which the chorionic villi project and through which the maternal blood circulates. the intervertebral space between the last lumbar and the first sacral vertebrae; suitable site for epidural injection. open spaces filled with lymph in connective or other tissue, especially in the brain and meninges. a recess in the dura mater that lodges the trigeminal ganglion. the central cavity and the intervals between the trabeculae of bone that contain the marrow. spaces in the dura mater along the superior sagittal sinus which receive the venous blood. a lymph space within the walls of an artery. a fascial space on the sole of the foot of primates, divided by septa into the lateral, middle and median plantar spaces. a portion of bone occupied by air-containing cells, especially the spaces constituting the paranasal sinuses. the space between the peritoneum and the dorsal abdominal wall. the space behind the pharynx, containing areolar tissue. the space between the arachnoid and the pia mater, containing cerebrospinal fluid. the space between the dura mater and the arachnoid. the space between the diaphragm and subjacent organs of bipeds. somewhat triangular space in the body cavity cranial to the umbilicus. a lymph space between the sclera and Tenon's capsule.